All matter and energy interchanges are equal (reciprocal) and proportional. 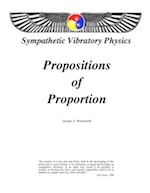 Wentworth's masterly treatment of the many propositions of proportion present a simple and clear understanding of these two ever-present attributes of matter, energy and geometry. Further it is now clear The Theory and Propositions of Proportion form an important and essential part of Iverson's Quantum Arithmetic.